Registered nurses (RNs) are the backbone of the U.S. nursing profession. Oregon’s RNs must obtain either an associate’s degree in nursing (ADN) or a bachelor of science in nursing (BSN). This rigorous training distinguishes them from licensed practical nurses (LPNs) and certified nursing assistants (CNAs), who need only earn a certificate. ADN programs are typically offered at community colleges, while BSN programs are available at four-year colleges and universities. Both programs explore anatomy, clinical psychology, and practical nursing care on a base of general education requirements. Candidates in either pathway must pass the state-mandated NCLEX-RN national licensure exam. RNs administer medications and treatments, operate medical equipment, perform diagnostic tests, and establish patient care plans. Nursing students in the Eugene metropolitan area typically complete the ADN program at Lane Community College. Many then transfer to pursue a BSN degree through Oregon Health & Science University. Licensed practical nurses are trained in physiology, medication, and basic patient care. They must complete a 12- to 18-month certificate program and successfully pass the NCLEX-PN national licensure exam before practicing. LPNs monitor patient health, discuss care with patients, listen to their concerns, and administer bedside care. Residents of Eugene, Oregon, can pursue the LPN certificate at both Lane Community College and Pioneer Pacific College in Springfield. Nursing assistants must complete a brief eight- to ten-week training program and pass a state certification test. They work under the supervision of LPNs and RNs to provide critical patient care. Frequent tasks include measuring vitals and helping patients to bathe, eat, and dress. Regardless of the role, all nurses will find ample employment opportunities in the Eugene metro area. Good Samaritan Regional Medical Center and Corvallis Clinic are two top nursing employers in nearby Corvallis, Oregon. 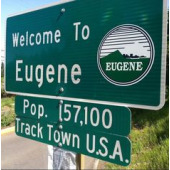 Eugene’s nurses enjoy competitive salaries. The city’s RNs earn a median annual salary of $80,320. LPNs receive $45,300 per year, while CNAs take home $27,230 annually. You can launch your Eugene nursing career at an accredited local school. Browse our detailed profile below of nursing programs in the metropolitan area.